The War of 1812 at sea is often thought of in terms of epic single-ship actions between frigates, but one of the most bloody encounters took place not just between two much smaller craft, but in British home waters. In August 1813 an American brig was operating in the general are between Britain and Ireland and had already taken some twenty prizes. It is an example of just how shortsighted – even blind – navies were prior to the arrival of aircraft and radar, since the waters involved on this occasion were very close to land. Commissioned in 1803, the USS Argus had already had a very active career, having served in the First Barbary War. Two eminent US naval heroes, Stephen Decatur and Isaac Hull, were to command her in succession in this period and she participated in the blockade of Tripoli and the capture of Derna in 1805. The climax of the latter action was the Marine Corps assault on the gun batteries on shore and which is still remembered in the Marine Hymn (“…to the shores of Tripoli”). On August 12th a Royal Navy brig-of-war, HMS Pelican, Captain John Fordyce Maples (1770- 1847), armed with eighteen 24-pounders and two long 12-pounders, was sent out from Cork to cruise in St. George’s Channel, the narrow passage between Wales and Southern Ireland. Two days later the Pelican encountered the USS Argus, off St. David’s Head on the coast of Pembrokeshire. The Argus was in the act of setting fire to a captured merchantman which she had already pillaged. She clewed her courses to shorten sail but being unable to get the weather-gage gave Captain Maples the opportunity of running alongside. The American captain, W.H.Allen, was however confident of “gaining the victory in ten minutes”, this confidence perhaps arising from having served as first lieutenant on the frigate USS United States when she had captured the British frigate HMS Macedonian the previous year. Broadsides were exchanged for some twenty minutes. Captain Allen was wounded and taken below, and the Pelican, on the Argus’s weather quarter edged off to cross her stern to deliver a raking fire. Only swift action by the Argus’s sail-trimmers by taking the maintopsail aback and luffing the vessel frustrated this manoeuvre and enabled Argus to deliver another broadside. The Pelican again attempted the manoeuvre and the Argus was subjected to further severe punishment before Maples laid the Pelican alongside. Maples himself, sword in hand, led the boarding party. It met only a single volley of musketry, which killed Pelican’s master’s mate, a Mr. Young, and within minutes the American had struck her colours. Both vessels were badly damaged and Pelican’s losses amounted to six killed and twenty-one wounded out of a total complement of 104. Total American losses were 40. The entire action lasted some 45 minutes and Maples was rewarded by immediate promotion to Post Captain and the Order of the Bath. The less fortunate American commander, Captain Allen, died during amputation of his leg and was buried with full honours in a churchyard in Plymouth. The illustration above, from a 19th Century publication, shows a perhaps idealised impression (was Maple’s uniform this smart?) of the moment of boarding. Fifth book in the Dawlish Chronicles series but can be read in isolation. 1882: Florence Dawlish stands at the quayside in Portsmouth and watches the Royal Navy’s newest cruiser, HMS Leonidas, departing for the Far East under command of her husband Captain Nicholas Dawlish (as told in Britannia’s Spartan). Months of separation lie ahead, quiet months which she plans to fill with charitable works. Witnessing of the abduction of a young girl shatters that quiet, bringing Florence into brutal contact with the squalid underside of complacent Victorian society. With her personal loyalties challenged to the limit, and conscious that her persistence in seeking justice may damage her ambitious husband’s career, not to mention the possibility of prison for herself, Florence is drawn ever deeper into a maelstrom of corruption, espionage and violence. The enemies she faces are some of the most mighty in the nation. Merciless and vicious, their identities are protected by guile, power and influence. 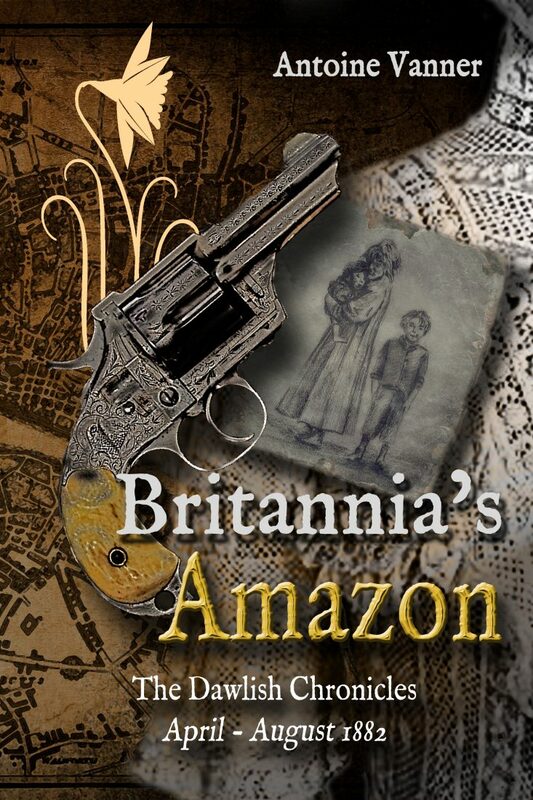 Britannia’s Amazon, fifth in the Dawlish Chronicles series, plays out in a world of extreme wealth and limitless poverty, marriages of American heiresses to British aristocracy and children starving in foul garrets, crusading journalists and hideously disfigured match-girls, arrogant aesthetes and ineffectual benevolence. This volume includes, as a bonus, the short story Britannia’s Eye, which casts light on Nicholas Dawlish’s boyhood and his decision to join the Royal Navy.